For the second year, the Small World Initiative® challenged students to DO SOMETHING ABOUT ANTIBIOTICS™ in recognition of the Centers for Disease Control & Prevention's (CDC) Annual Antibiotic Awareness Week (November 13th-19th) and global activities from the World Health Organization and other stakeholders. 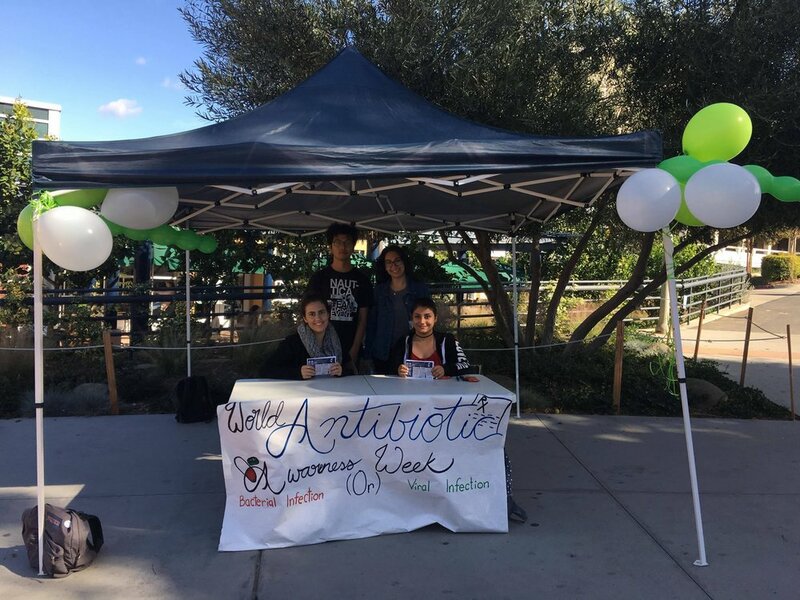 During November 2017, we teamed up with the CDC, the National Institutes of Health (NIH), and the Sociedad Española de Microbiología to encourage students to do something about the antibiotic crisis. As part of our engagement efforts, we participated in the CDC's #AntibioticResistance Twitter Chat on November 16th during which the #AntibioticResistance hashtag reached 9.3M people, generating 97.9M total impressions from more than 2.7K mentions by 1,025 users on social media. 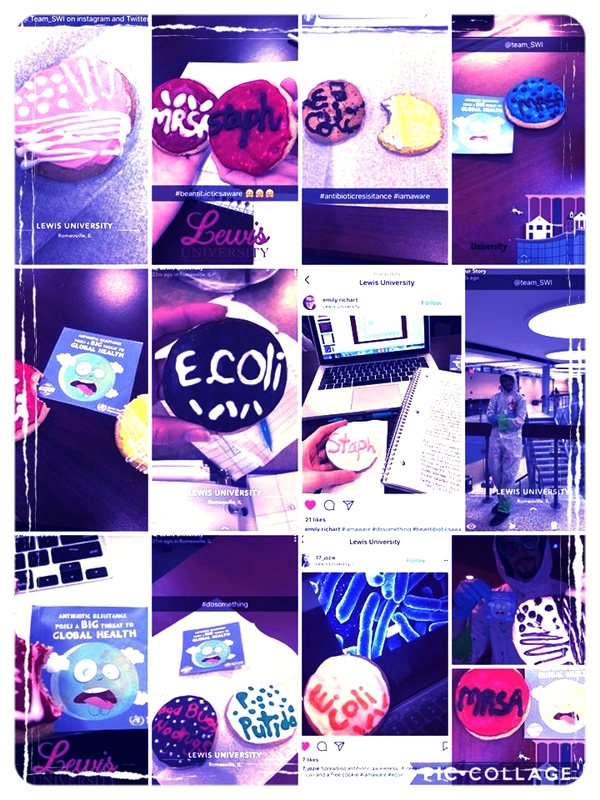 Check out the Do Something Challenge™ entries below to see the creative and impactful ways students around the world are taking action on one of the most pressing global challenges of our time. The judges were blown away by the number of outstanding entries and would like to thank everyone who participated. We are pleased to announce our winning teams and recognize our honorable mentions. Seven students representing five different majors (chemistry, biology, business management, animal science, public health, and health sciences) at BYU-Idaho teamed up for a university-wide campaign that included an interview on BYU-Idaho radio covering antibiotic resistance and the global crisis, an article in the BYU-Idaho Scroll newspaper on SWI and what students on campus are doing in the research lab, and a 5K run. 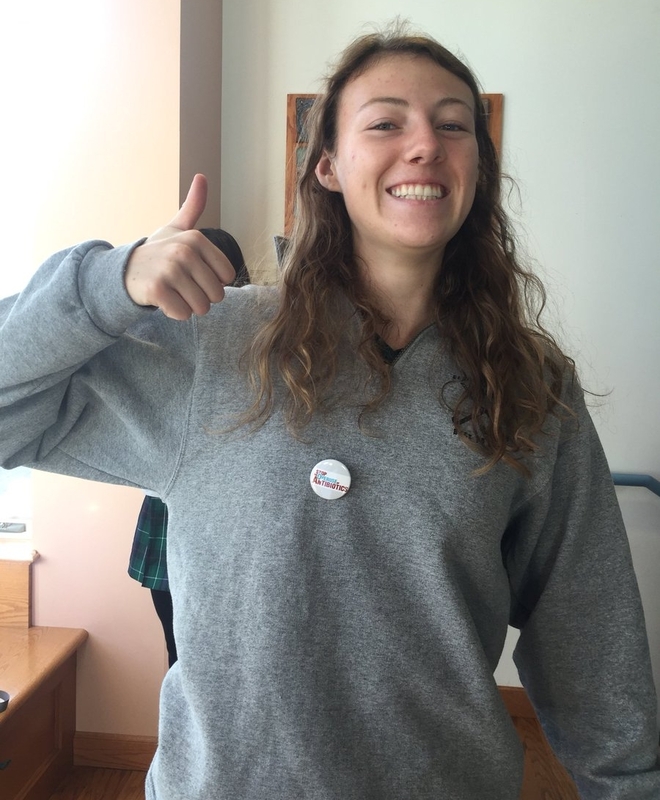 Prior to the race, the team spent four hours in the Student Union building handing out leaflets to let students know about the race. On the day of the race, the team invited a pharmacist to be a keynote speaker at the start of the race and secured the support of a separate pharmacist to sponsor the race. They also designed a t-shirt to wear during the race and led a social media campaign. 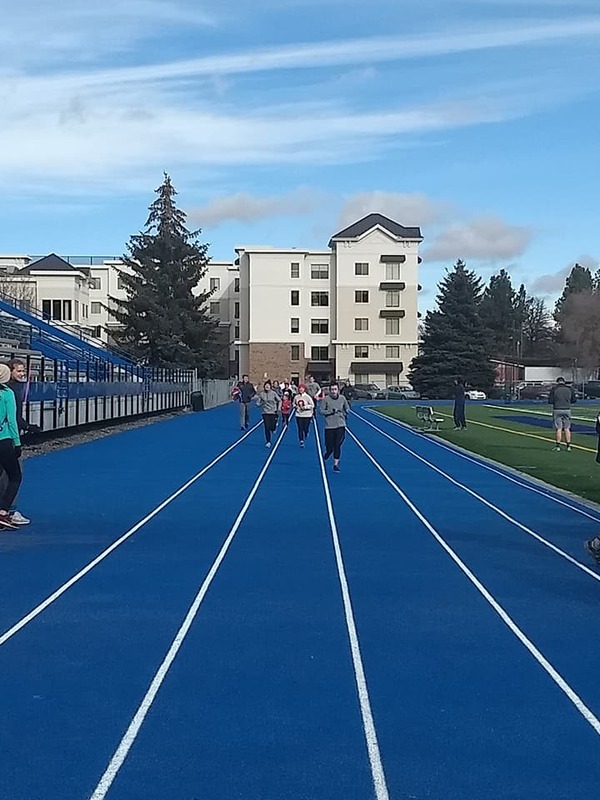 In spite of the balmy 30-degree weather, over 300 students participated in the 5K. 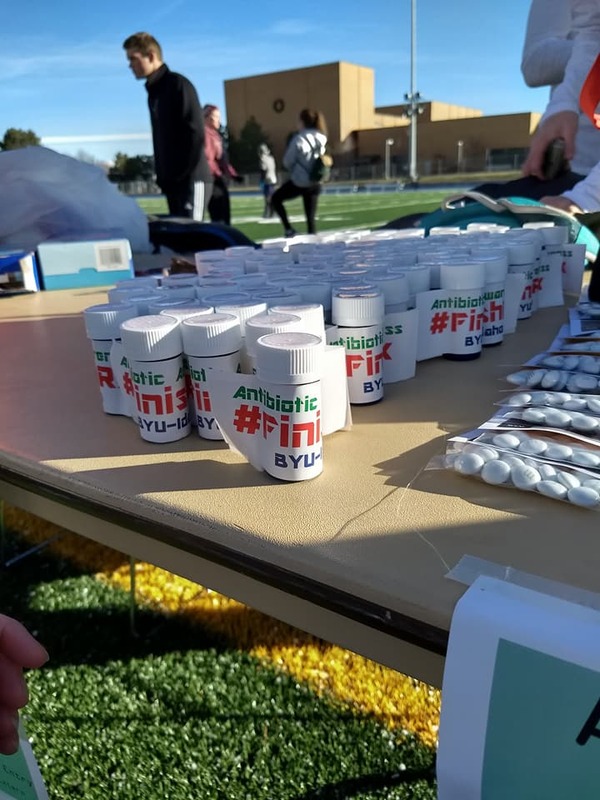 The team gave out empty pill bottles with a sticker that said "FinishRx", which meant to finish the course of the prescription and finish the race, and a small bag of candy with a leaflet reminding them of what they can do to curb the trend towards antibiotic resistance. Click here to listen to the radio interview. Brockton students put together a community engagement event and spent significant time publicizing the event in advance. During the Brockton Holiday Parade with thousands of people in attendance, students created a banner, marched in the parade, and passed out 400 awareness flyers announcing the class's #DoSomething challenge event. 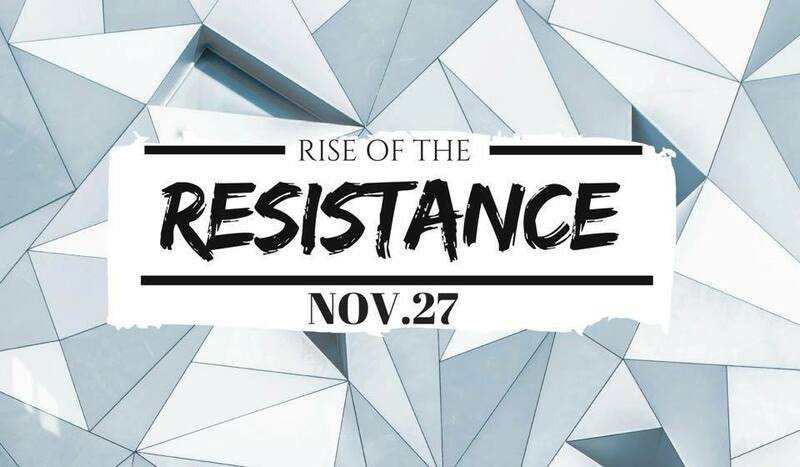 They further amplified the event over Twitter, through school announcements, and by creating and posting 135 informational posters around school. During the community engagement event, they greeted attendees, held a poster session and bake sale, and delivered a public service announcement, PowerPoint, and Kahoot Review. This event was emceed and even had a dynamic entrance and exit with a beat, rap, and hype leader. This was all captured on video and included participants and guests from the Brockton campus, pharmaceutical companies, academia, and broader Boston community. 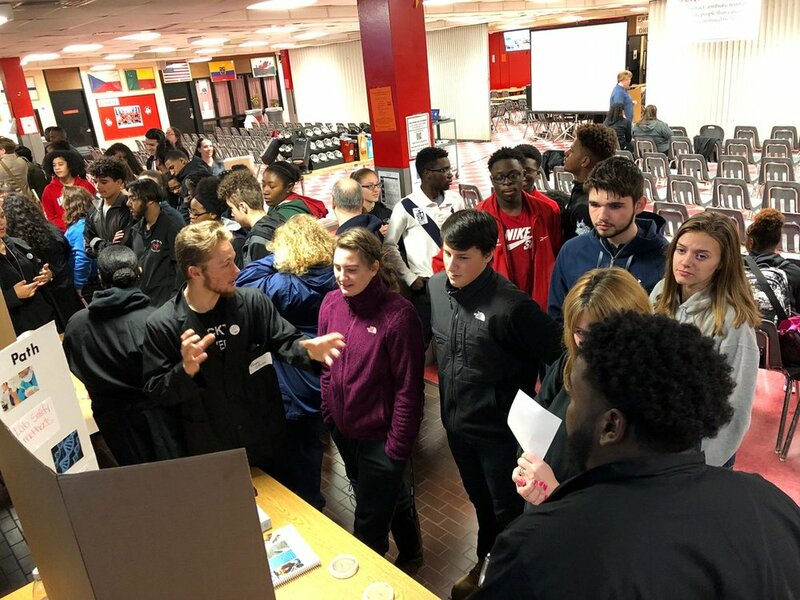 For an article leading up to the event from The Enterprise, click here ("Bug zappers: Brockton High students take on antibiotic resistance"). 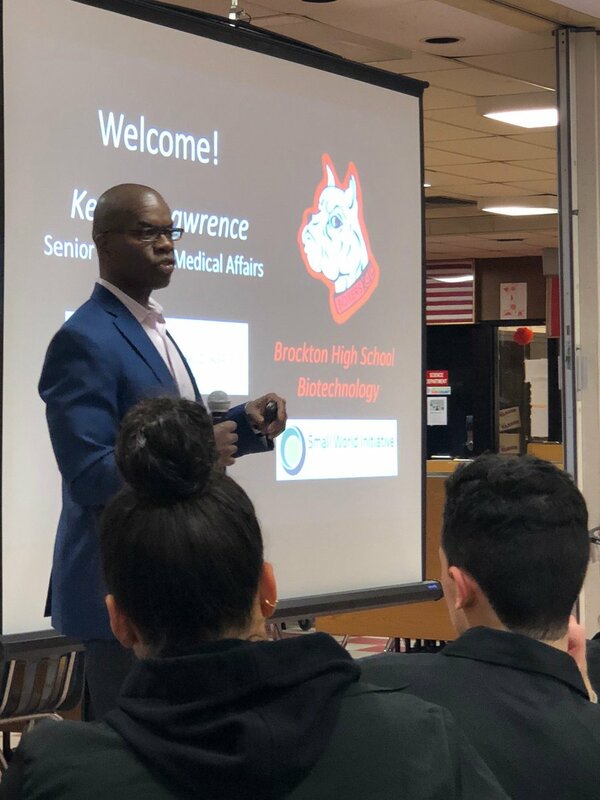 For coverage of the event from The Enterprise, click here ("Pushing the limits of antibiotics and education in Brockton"). Watch the PSA, dynamic entrance, and exit beat below. This team put together a bilingual Spanish/English antimicrobial resistance quiz. To participate and post your results on Facebook, please click here. 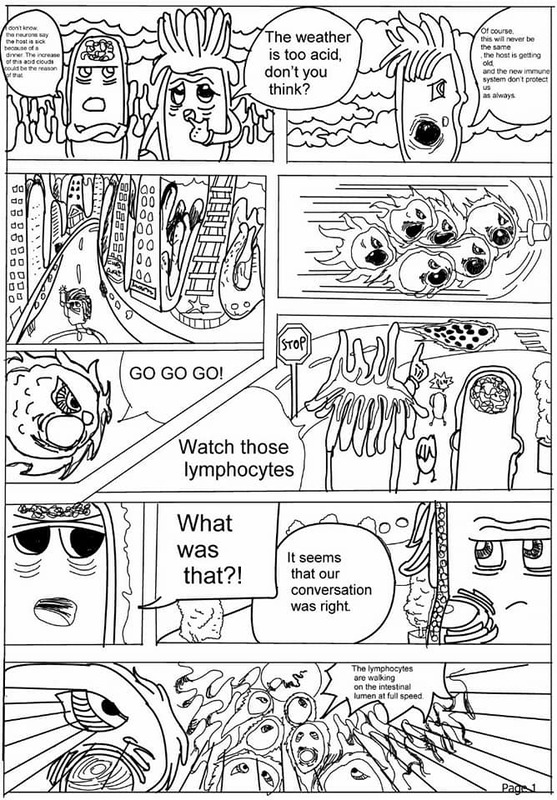 This team put together a comic strip on antibiotic resistance. Reflection. Antibiotic resistance is an actual problem that kills more people per year than traffic accidents. Moreover, it's supposed that by 2050 it will be common to die by mild infection like a wound. Everybody is exposed to this resistant bacteria in food, animals and plants treated with antibiotics. 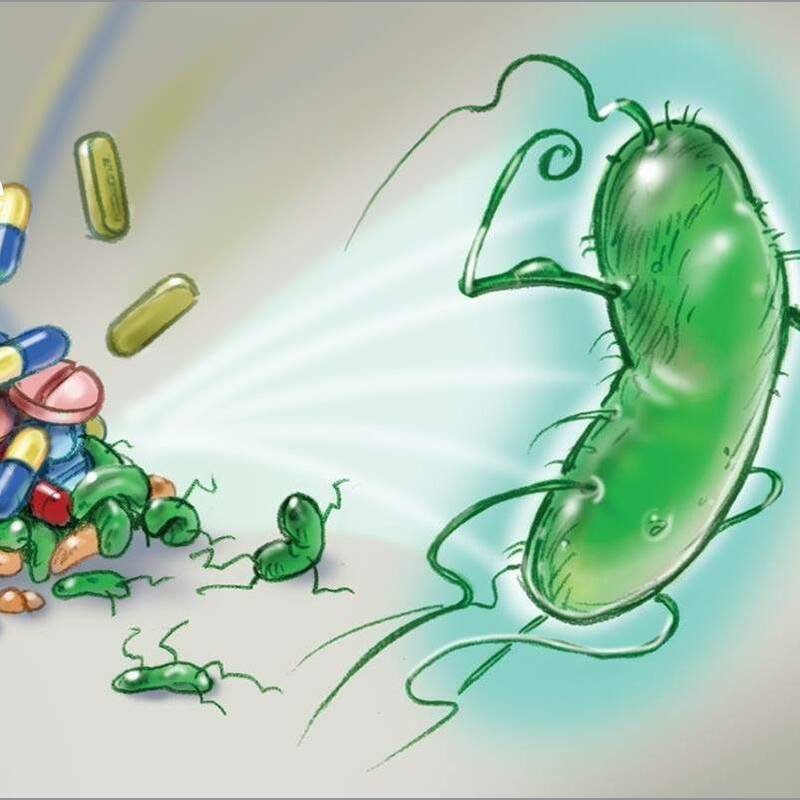 The excessive use and unnecessary prescription of antibiotics has caused an increase of these resistant bacteria and a high demand of new antibiotics. So, setting in motion science projects like SWI to search for new antibiotics and also contribute to the consciousness-raising of the population is important. Take medication only if any health personnel prescribes it. Don't ask for more medication. Prevent infections by washing your hands frequently, cooking food in hygienic ways, etc. This team put together an Antibacterial Soap Opera. Using a play on words, the video is a soap opera about antibacterial soap. Abigail cross-stitched an important message: "Resist the misuse of antibiotics." This team created a display, handout, and pins impacting more than 200 people. Kaia created slime petri dishes that could be opened like fortune cookies to reveal useful information about antibiotic resistance. 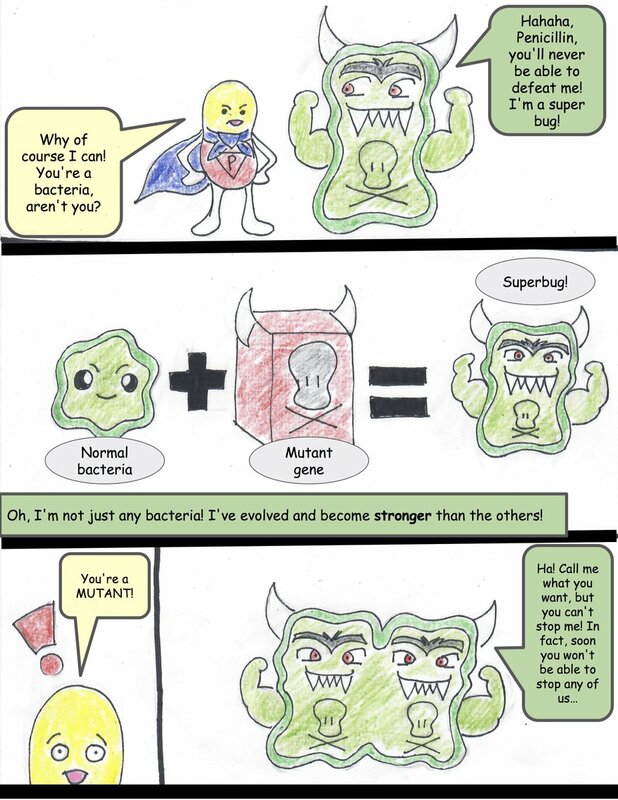 This dynamic duo created a really cool comic with the hero Super Penicillin struggling against his archnemeses Superbugs. 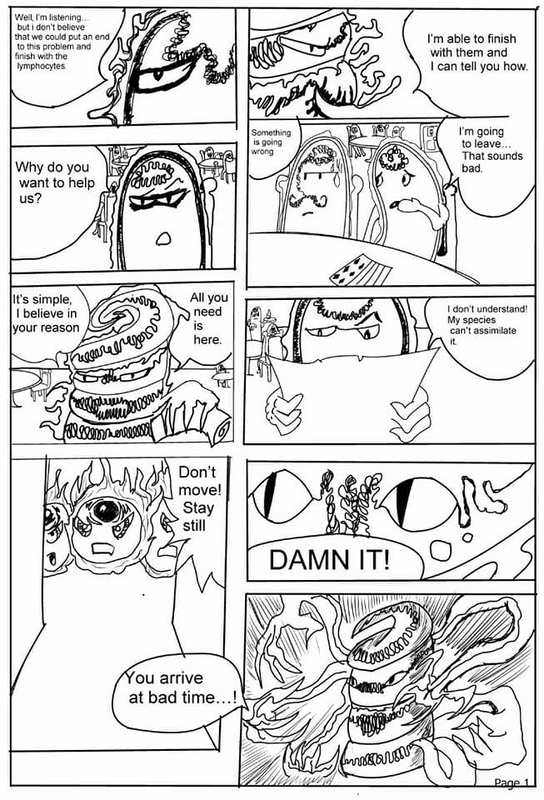 Our hero must recruit the help of the readers to take on the crisis. Ever wonder if you can improve the world in a bathroom stall? Mhairi did just that by creating "stall talks" – so people can learn and read while using the facilities. These talks come with a QR code that links to a Buzzfeed Quiz. To take the quiz, click here. Natalie made posters and engaged students at her school. During lunch, she handed out cookies with bacterial cultures, antibiotics, and frowny faces along with note cards with ways to solve the antibiotic crisis. This team made three memes, using humor to draw attention to a serious subject. 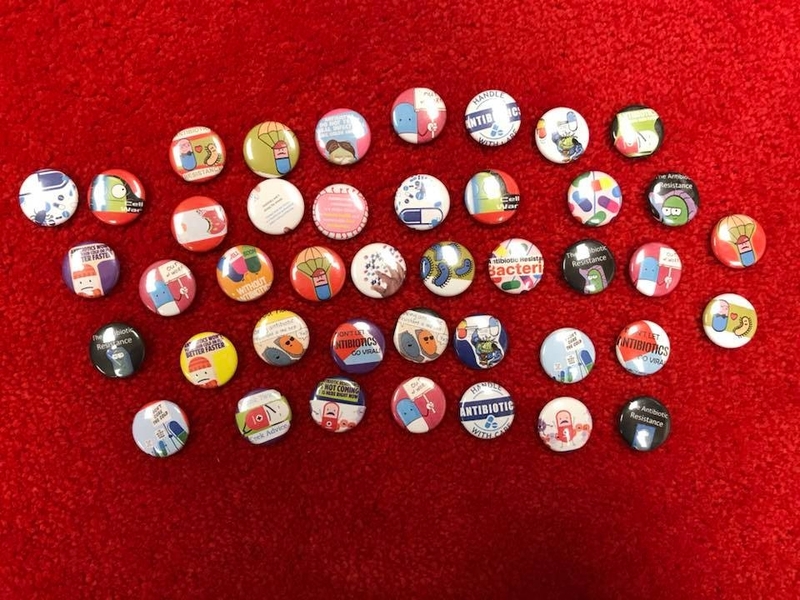 Raleigh used her creativity to make 40 unique pins about antibiotic resistance. Roxanne wrote the lyrics for and sang a song about antibiotic resistance. Check it out here on SoundHound. 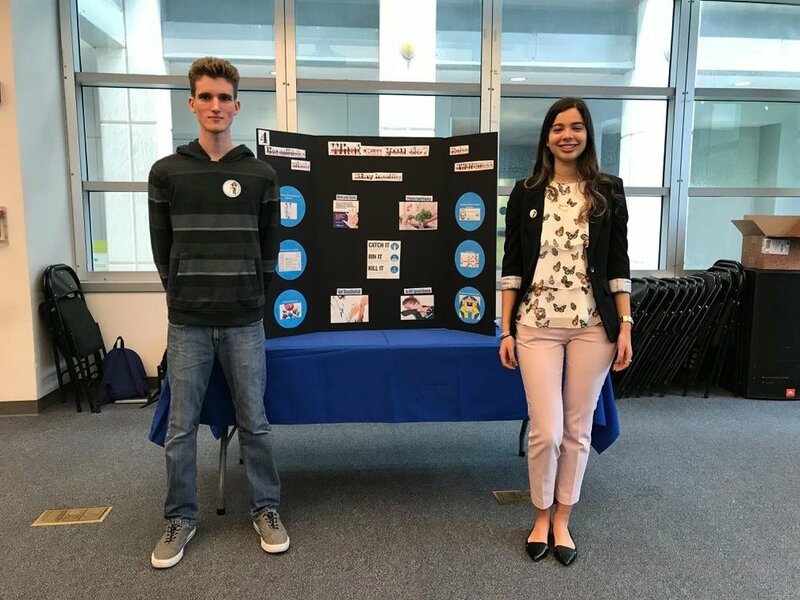 This team created an informative display in the nurse's office, a prime place to educate people who might be feeling ill and considering taking antibiotics. This team led an interactive slide show presentation for the entire middle school and interviewed two students beforehand and afterwards to see what they learned about the antibiotic crisis. Valentina created a display on the causes of antibiotic resistance and what you can do about it. Hannah wrote the music and lyrics to a song about the antibiotic crisis. She performed this song at school in front her peers and posted it on YouTube. Listen to her song here. 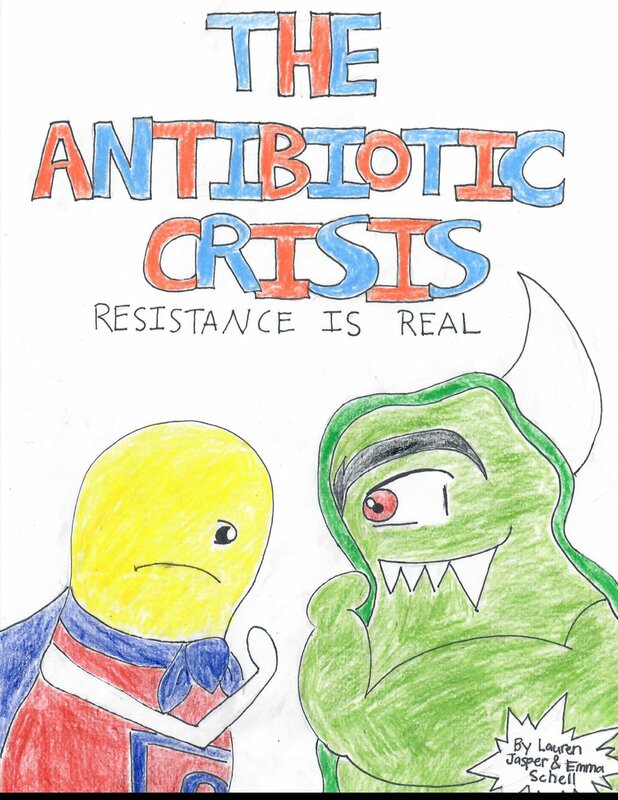 This team spread awareness about antibiotic resistance to the student body. Because the school is located in a glass building, they spread the message using "science graffiti"! 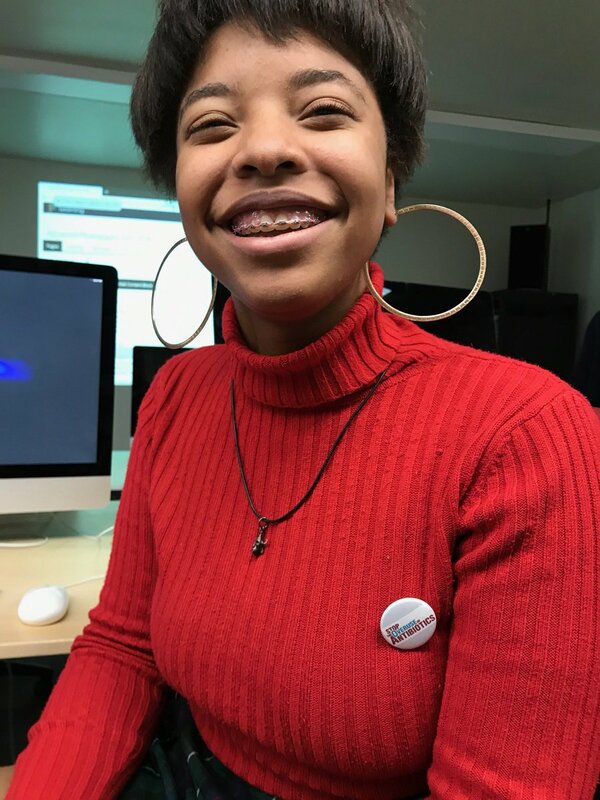 In addition, they gave each student a custom "Be Antibiotics Aware" hair tie and made a video to capture their efforts. Watch the video below. This team created a high action movie trailer to highlight their quest to discover new antibiotics. Molly wrote the lyrics to a catchy song about antibiotic resistance and sang them to a Justin Bieber song. Listen to her song below. This team visited the biology and nursing classes and delivered special petri dish and ESKAPE inspired cookies along with information about antibiotic resistance. 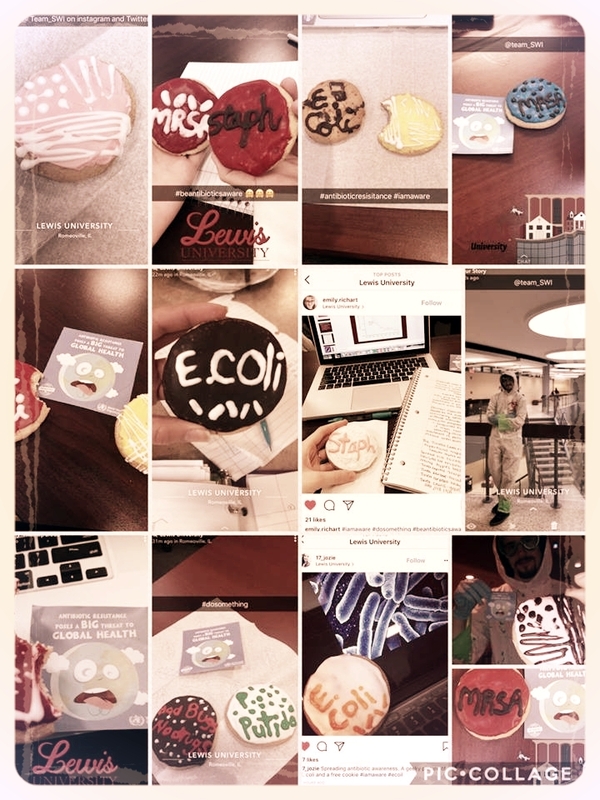 Students in these classes took to social media to Snapchat, Tweet, Instagram, and Facebook post with the cookies and the message to #dosomething #BeAntibioticsAware while spreading #AntibioticResistance awareness. 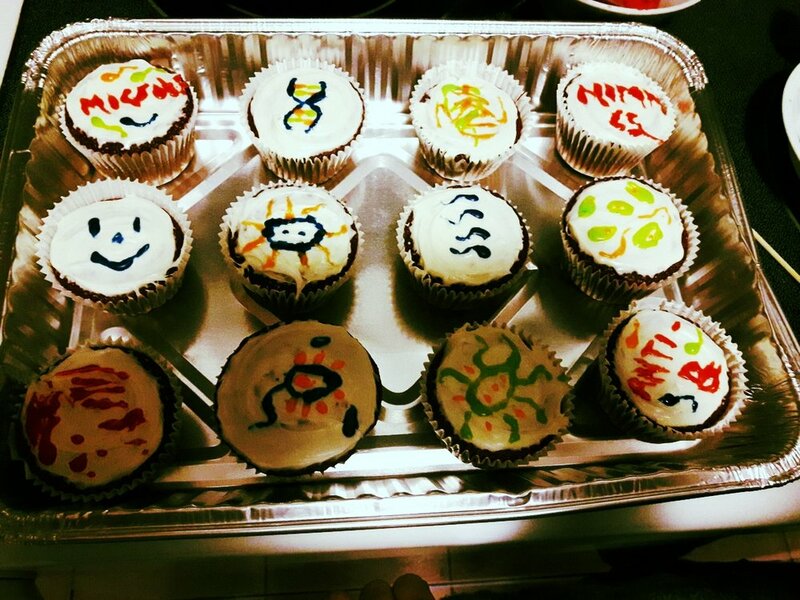 This team held a microbial themed bake sale. 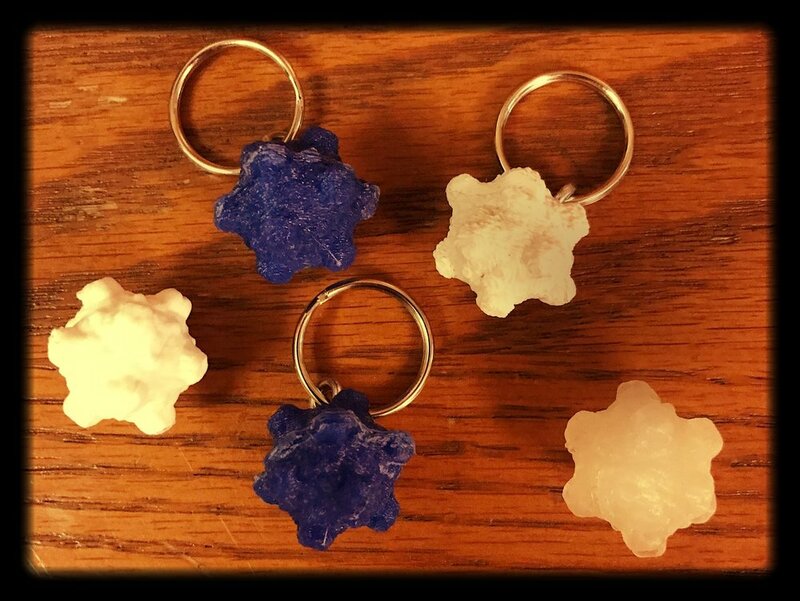 This team created 3D-printed keychains and models. According to the team, "Some of you may be wondering why we chose to print viruses rather than bacteria, since viral infections absolutely don’t require antibiotics. One way in which antibiotic resistance spreads is through transduction. This is when a bacteriophage picks up a gene in one bacterium and moves it to another bacterium. This is a major mechanism of horizontal gene transfer and facilitates the spread of genes, which grants bacteria resistance to antibiotics. 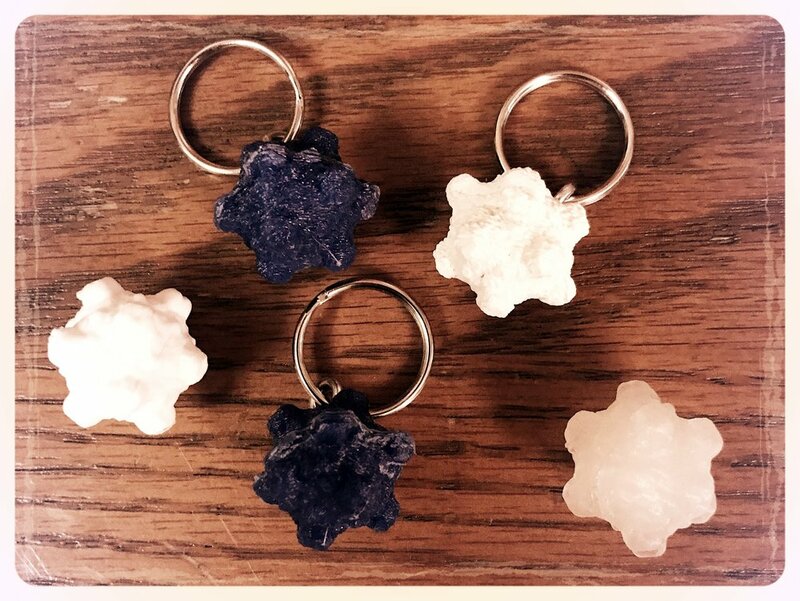 We want the bacteriophage keychains to be conversation starters. 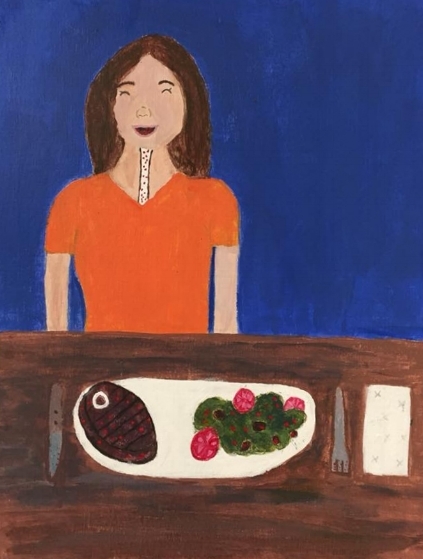 We hope that they can help turn an abstract notion like “the spread of antibiotic resistance” into something more tangible by being, well, tangible." 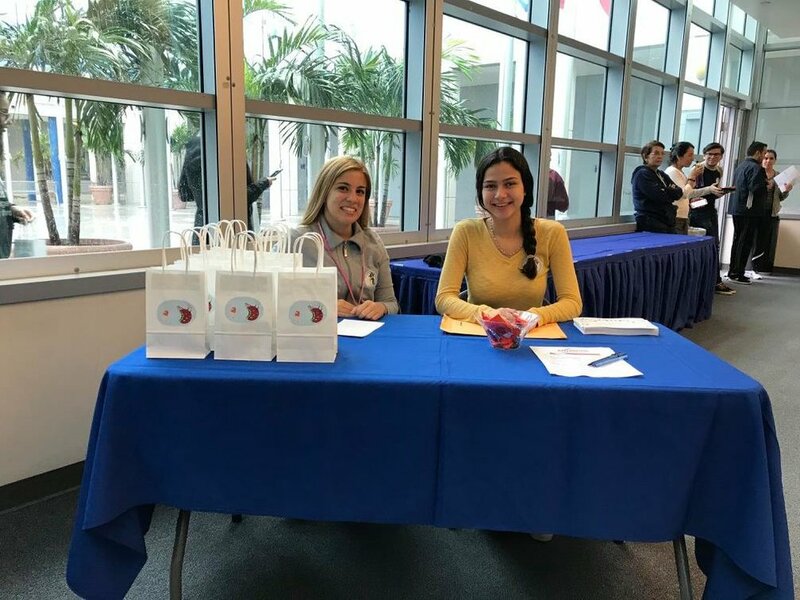 On the Miami Dade College Interamerican campus, the TriBeta Biological Honor Society promoted antibiotic awareness through the use of numerous activities. 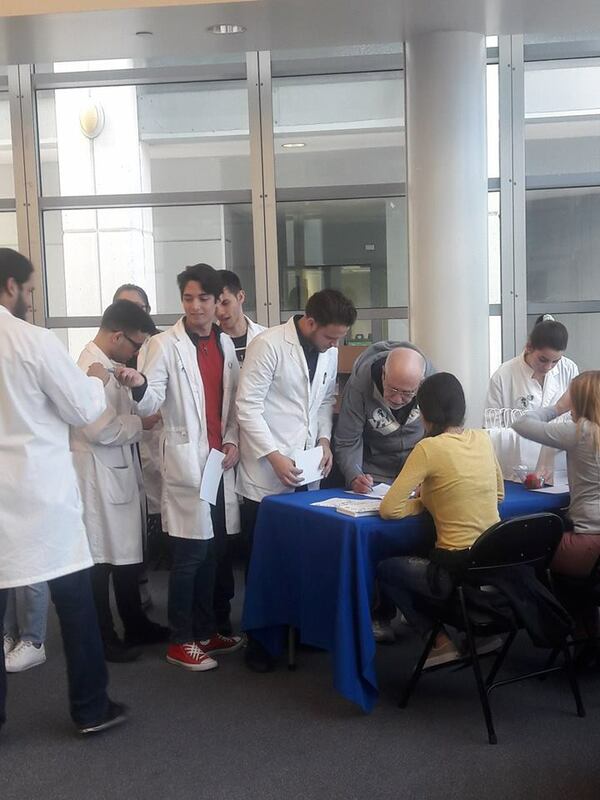 TriBeta Interamerican helped spread awareness about antibiotic resistance by conducting more than one hundred surveys, signing pledges, showcasing poster exhibits, creating antibiotic-resistant pins, antibacterial kits, and interactive games. In addition, a demonstration with balloons was done in order to reveal the consequences of the improper use of antibiotics in our community. This activity was done along with the Antibiotic Resistance Demo. Throughout the week, antibiotic resistance messages were shown on a loop, promoting the preservation of the medication. To see more, click here to visit their Antibiotic Awareness. This team created a great video detailing antibiotic resistance and the Small World Initiative. This incredible team created multiple engaging online components and took over campus with targeted outreach efforts and an interactive workshop. Sina and Teja created an informational video and Buzzfeed quiz. The video uses humor to share the dangers of incorrect antibiotic use, including zombies. 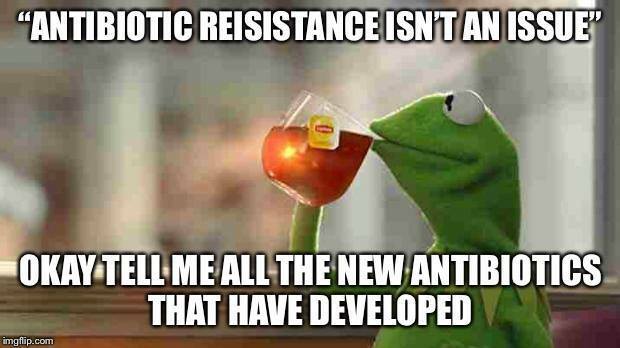 As they state themselves, unlike the video, ANTIBIOTIC RESISTANCE is NOT something to joke about. Check out their video below. To take their fun Buzzfeed quiz and find out if you are (almost) a doctor, click here. Yuriy, Sara, Jill, Tara, Catherine, Beoung, Jasmine, Wayne, Marc, and Alfonso worked together on the animated video component. They created an incredibly ambitious YouTube video with original drawings and voiceover. Watch as Dr. 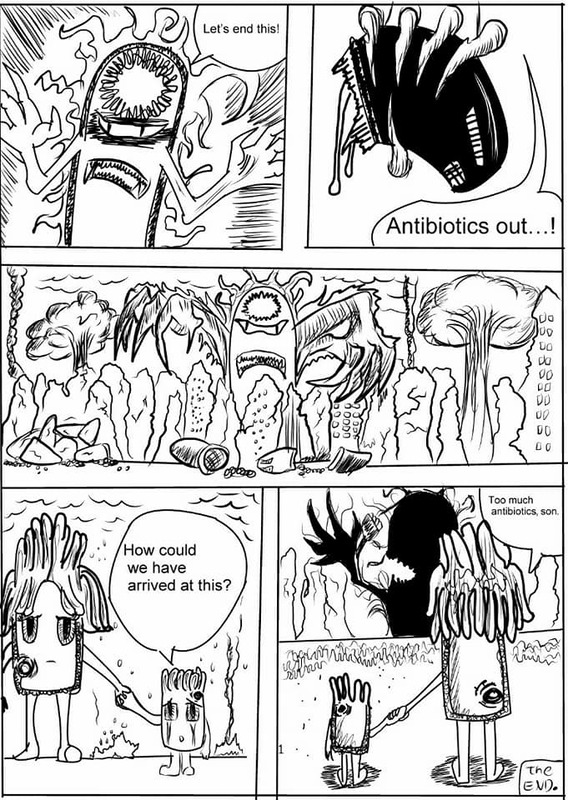 Cure treats a patient and explains everything you need to know about antibiotic resistance. The group's Antibiotic Action Team (Nora, Baina, Simran, Pramuk, Alin, Shafaq, Angelo, Alexis, Allison, Jenny, Selin, and Pohsien) led community outreach activities, including setting up an information desk and speaking with other students, handing out flyers, creating posters, and gauging what participants learned. Check out their incredible Star Wars-themed video detailing their efforts below. Meanwhile, Justin, Araiye, and Tammy hosted a fun and interactive Antibiotic Resistance Workshop on campus with pre/post surveys accompanied with a presentation. The presentation contained informative slides about antibiotics, case studies, antibiotic resistance, and how applicable it is to research and community. The audience also participated in hands-on activities during the team's presentation. After recording survey responses, the team found that individuals had increased 50% in knowledge about antibiotic resistance. 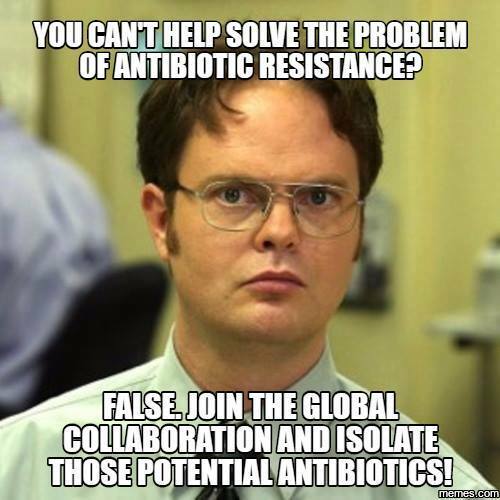 This team created 10 memes as a fun way to share the important message of antibiotic resistance. This team conducted research to assess the community's general knowledge about and perception of antibiotics. The team sent out a survey, received 315 responses, and analyzed the results. Check out the team's poster covering this research below. Mehde and Mouhamad teamed up to research the habits of people at their university. 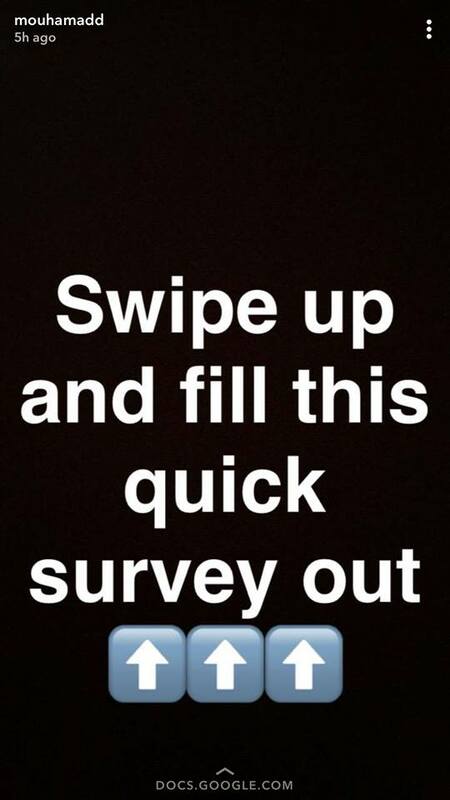 They had people fill out surveys on iPads around campus and posted the link to the survey on Facebook and Snapchat, making it visible to people near their geographical area. All together, they gathered 194 surveys. They found it surprising to find that most people wash their hands after they use the restroom, but they do not use some sort of barrier to avoid touching the door handle as they exit the restroom. In addition, they found that most people believe that antibiotics are safe. With the results in hand, they are emailing back everyone who took the survey with more information about antibiotic resistance. Navid participated in the challenge by designing an interactive flow chart. If you have ever seen The Matrix, you will see that the flow chart was inspired from the scene where Morpheus offers Neo the choice between a red pill and a blue pill. Remember, all Morpheus is offering is the truth. Nothing more. Navid's flow chart also uncovers some truths. Navid starts with the scenario of having a cold, and the participant is asked to choose an option. Both the red and blue pills are common antibiotics. As the participants goes through the flow chart, they learn about the function of the antibiotics, why they should not be used for viruses, and how improper use increases selection pressure for antibiotic resistance. The overarching purpose is to illustrate that the problem of antibiotic resistance is exacerbated as a result of improper use and that people should not take antibiotics for a viral infection. As such, there is a small subtle option that says “choose none,” and everyone should ideally choose that option under this scenario. Navid posted the infographic on Facebook, and the post was shared by fellow UCI undergraduates and undergraduates at UCSB, Emory, and Michigan from a variety of disciplines, a tennis director, a middle school teacher, a medical student, a physician, and more, from ages 16-70. 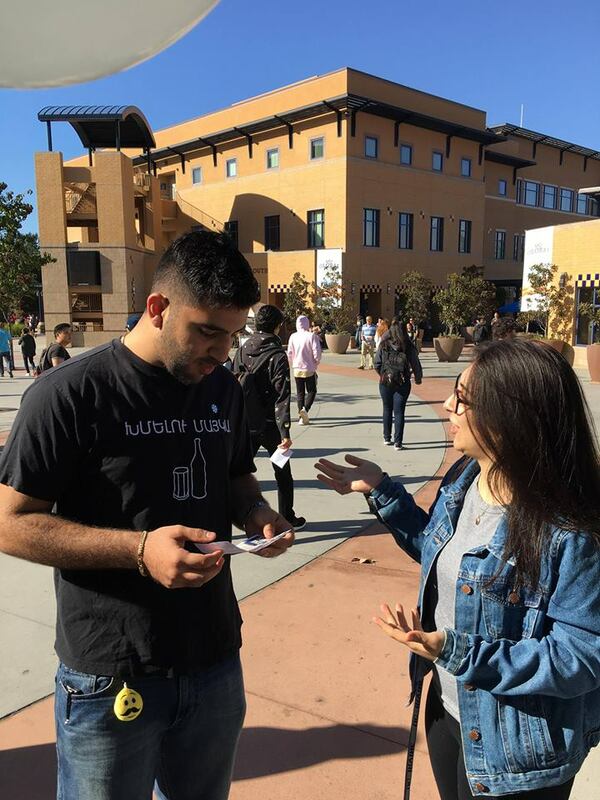 This team conducted research using a survey to assess the level of antibiotic resistance awareness in the undergraduate population at the University of California, Irvine. To achieve maximum participation and responses, the survey was posted on four different graduating classes' Facebook pages (class of 2018, 2019, 2020, 2021) to obtain a diverse yet sufficient amount of data. Through this survey, the team hopes to raise awareness about antibiotic resistance and provide recommendations for improvement. Read about their research below. This team conducted research using a multiple-choice survey assessing general knowledge about the antibiotic crisis and comparing responses from college graduates and non-college graduates. The survey directed participants to additional information about antibiotics. To check out their survey, please click here. More than 175 people responded, and the team presented these results in the below newsletter complete with memes. Have you ever been curious which antibiotic resistant bacteria you most resemble? Now is your chance to find out by taking a unique Buzzfeed quiz crafted by Stephanie and Michelle. The quiz not only determines your hazard level but also assigns you a specific strain. The results provide relevant facts and a link to the CDC website for further information. Click here to participate in their quiz: "Which Antibiotic Resistant Bacteria Are You?" Ashley wrote a petition to "Spread Awareness Not Bacteria!" calling on her Congressman to "act now to increase the funding and promotion of research into new antibiotics and pass legislation to aid with the ever growing antibiotic crisis." 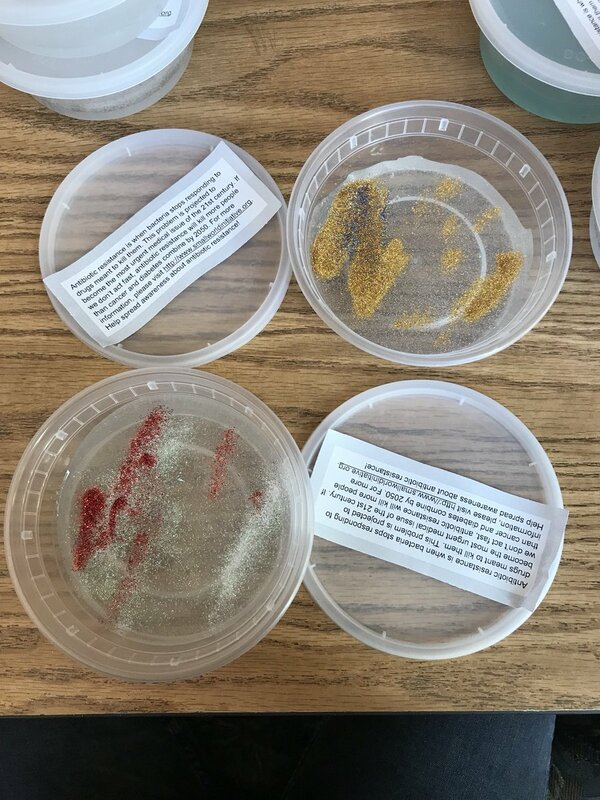 To draw students over to learn about what she was doing, she baked petri dish cookies to hand out. To learn more about her efforts, check out her petition below. Helen held a microbiology movie night and baked petri dish cookies! This team created a movie trailer about superbugs "based on true events." While you might need to watch this one with the lights on thanks to the dramatic sound effects, images, and text, it captures the scary reality of antibiotic resistance. Rebekah made antibiotic resistance brownies (and won best bake prize)! This team worked to spread antibiotic awareness by teaching middle schoolers about antibiotics during The Science Festival @WIDiscovery at the University of Wisconsin-Madison. 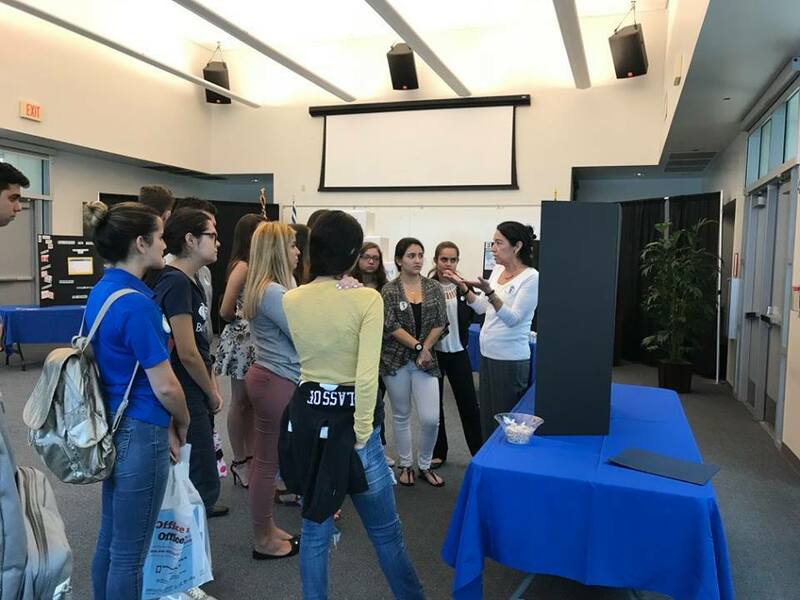 The Science Festival is a large outreach effort put on by the Wisconsin Institute for Discovery and Wisconsin Alumni Research Foundation and has major impacts in generating youth interest in science across the state. 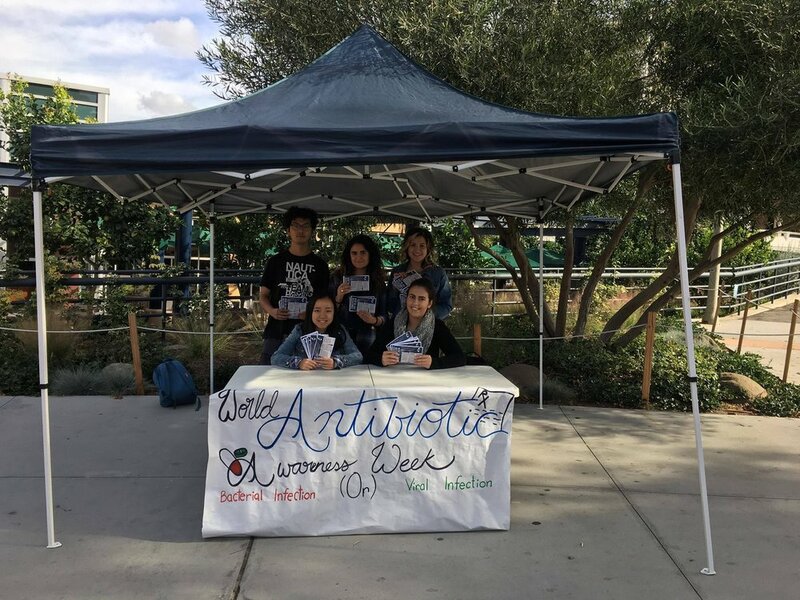 During this event, the team taught kids to #DoSomething and #BeAntibioticsAware by informing them about what antibiotics are, how to use them correctly, the effects of misuse, and why there is an antibiotic crisis occurring due to #AntibioticsResistance. Afterward, they participated in the lab by doing their own soil dilutions and plating. The team also shared what they have been doing in their lab and what they are doing about the antibiotic crisis. Participants walked away ready to spread their newfound knowledge of antibiotics! Katie created a fun Buzzfeed quiz about antibiotic resistance. 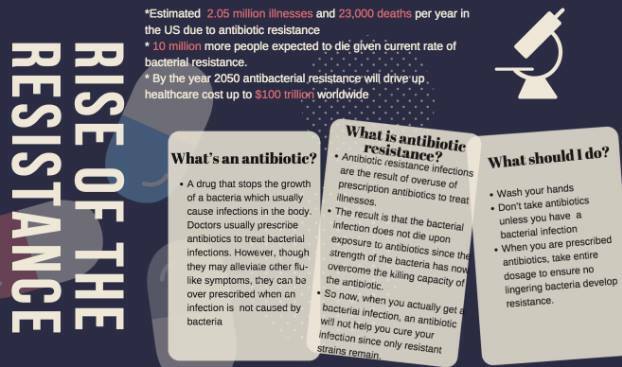 This student created a poster on antibiotic resistance, posted at her school, and sought comments. Are you a current or former Small World Initiative® student? Enter our Do Something About Antibiotics Challenge to make a difference and win a prize. 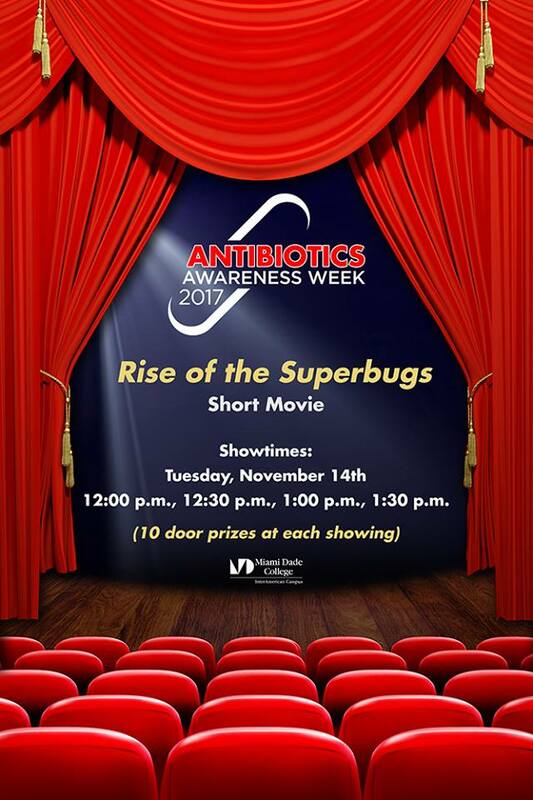 The Small World Initiative is teaming up with the Centers for Disease Control & Prevention (CDC) and the National Institutes of Health (NIH) to encourage you to do something about the antibiotic crisis in recognition of the CDC’s Annual Antibiotic Awareness Week (November 13th-19th). This coincides with global activities from the World Health Organization, European Union, Pan-American Health Organization (PAHO), and similar organizations in Canada and Australia. 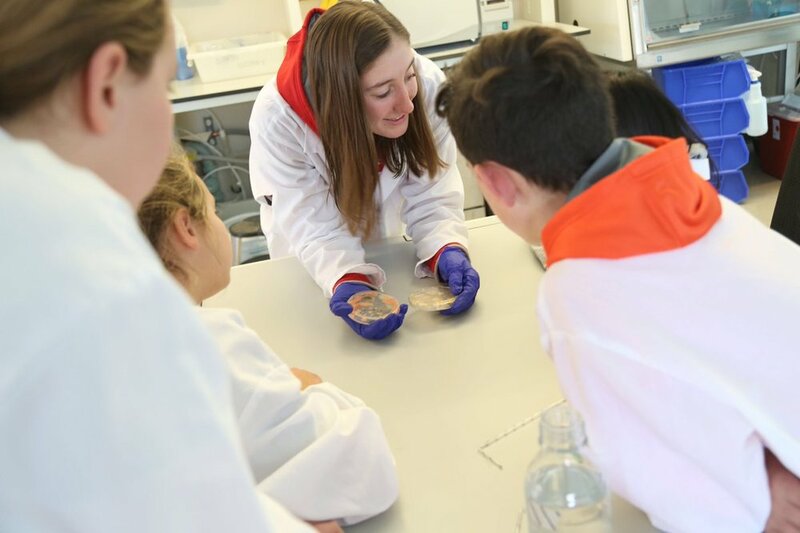 As Small World Initiative students know, antibiotic resistance – when bacteria stop responding to the drugs designed to kill them – is projected to become the most important medical challenge of the 21st century (WHO). Just last year, the United Nations called antibiotic resistance “the greatest and most urgent global risk.” Without action, we risk turning back the clock to a world where simple infections could kill otherwise healthy individuals just as they did prior to the discovery of antibiotics. In the US alone, superbugs (pathogens resistant to existing antibiotics) lead to more than 2 million illnesses, 23,000 deaths, and $35 billion in economic losses (CDC), and last year, the CDC announced that more than 800,000 Americans may soon be at risk of acquiring untreatable gonorrhea each year. If we continue on our current path and no significant action is taken by 2050, superbugs will kill 300 million people – more than cancer and diabetes combined (Review on Antimicrobial Resistance). Yet, pharmaceutical companies have shifted away from developing new antibiotics in favor of more lucrative ventures, and improper use of existing antibiotics exacerbates the problem. We are running out of time on confronting one of the most pressing global challenges of our time. Yet, we possess the ingenuity to solve this problem, and we already understand the key causes and many of the possible solutions. It is not too late if we respond effectively with global collaboration. 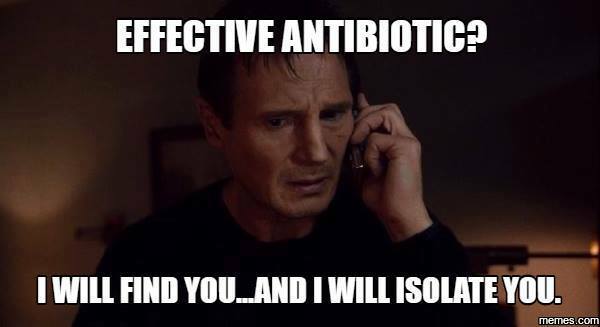 You have a very important role to play in stemming antibiotic resistance, and we are calling on you to do something. By far, the single most important action to slow the development and spread of antibiotic-resistant infections is to improve the mass-scale misuse and overuse of antibiotics in humans and agriculture. Up to half of all antibiotics use in humans is either unnecessary or inappropriate. Each year in the US alone, doctors write at least 80 million unnecessary antibiotic prescriptions, which makes improving antibiotic prescribing a national priority (CDC). On top of that, animals consume more than twice as many medically important antibiotics as humans, and nearly all of this consumption is for growth promotion or prophylactic (Review on Antimicrobial Resistance). Other factors include inadequate prevention and control of infections related to poor hygiene (wash hands! ), access to proper sanitation and safe water, and immunization. In addition to taking action to slow the spread of infections, we need to employ collaborative ways to find new antibiotics, and we need more people to join and support the Small World Initiative in our endeavor to crowdsource antibiotic discovery. Consider what impactful action you can take to help solve the public health emergency of our time. What can you do to help raise awareness of the threat of antibiotic resistance and get others to act? Do something about the antibiotic crisis. Use one of our ideas (below) or create your own. Get inspired by last year's creative entries here. Organize an Event – Ever want to share your research with the community? Maybe, you want to host an open house and walk others through what you are doing and why it is important. Are you a movie lover? Consider screening an outbreak-style film with an important message on how to keep that from happening in real life. Like games? Consider hosting a tournament to play Gut Check or Pandemic. Bake for Antibiotic Resistance – Do you like to practice your plating skills in the kitchen? Wonder what impact eating icing streaked, Petri-dish shaped cookies has on people? 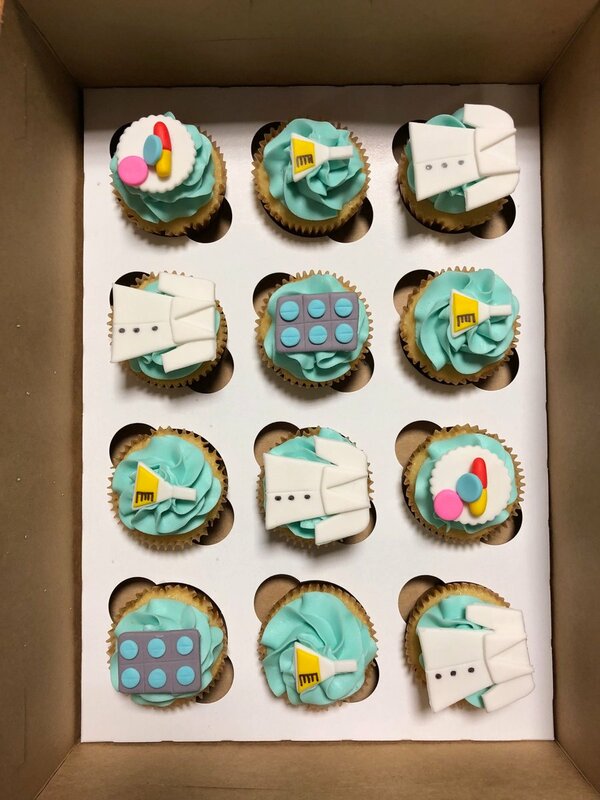 Hold an antibiotic-themed bake sale. Measure – Wonder how many people at your school really wash their hands after using the restroom? 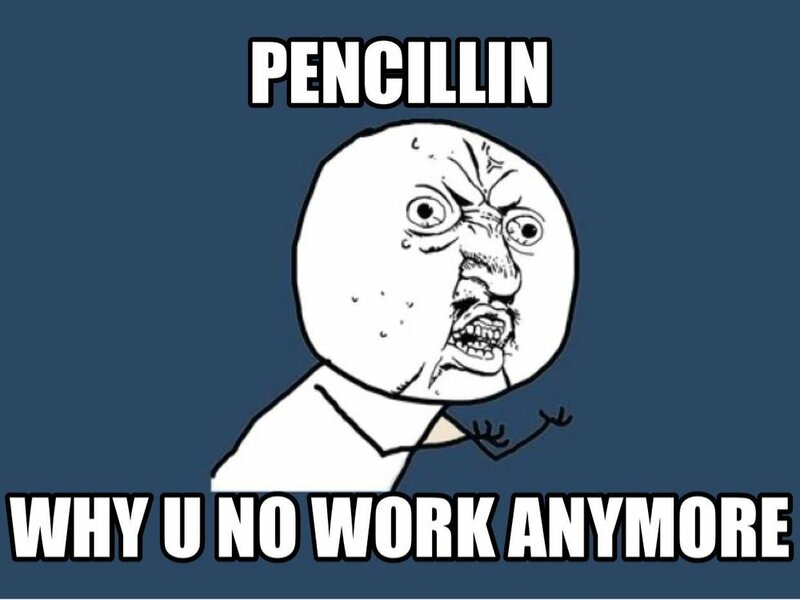 Curious about whether your classmates demand antibiotics every time they feel sick? Create a mini-study and share your results. How does your school compare to national averages? What recommendations do you have for improvement? 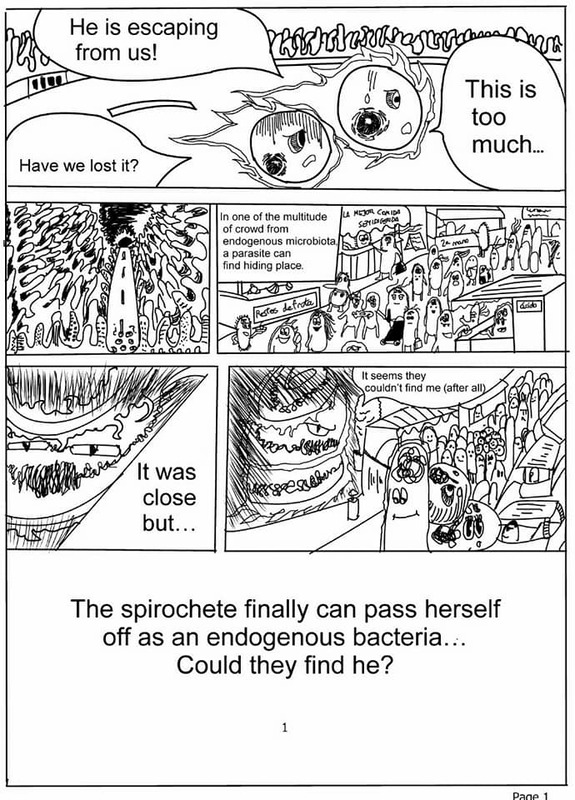 Write a Song – Did you ever want to join The Voice but did not know how to incorporate your love for microbiology? Not a great singer but enjoy lip syncing while digging in soil and hunting for microbes? 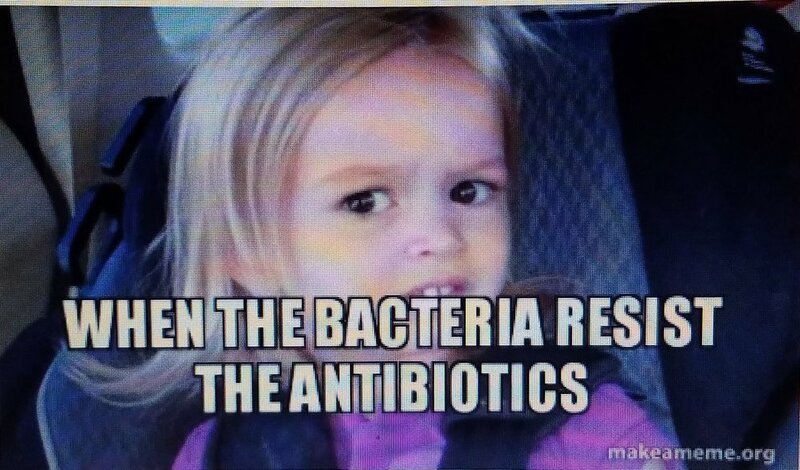 Make a funny song or lip sync about something related to antibiotic resistance. 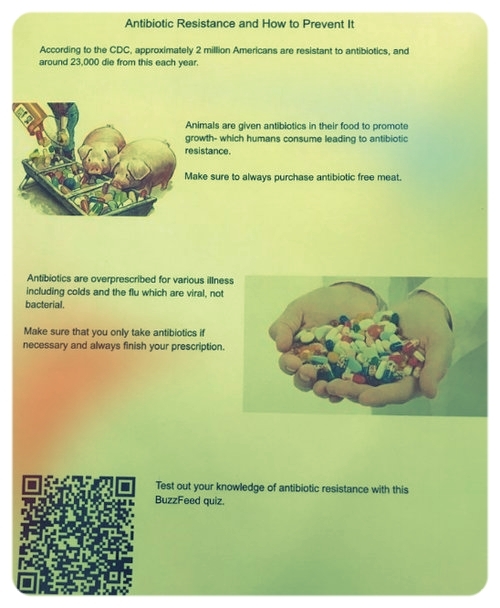 Buzz – Create an online interactive quiz on buzzfeed to spread awareness on antibiotic resistance. Remember to follow their posting rules. Fundraise – Add a fundraising element to your action. Consider using funds to help students at your school attend the Small World Initiative Symposium or donating to help the Small World Initiative train more educators from under-resourced schools. Film screenings and bake sales can have a fundraising element. Or, maybe, you want to design a catchy t-shirt on antibiotic resistance. Even better, create the next ice bucket challenge. Be sure to get permission from your instructor first. Let us know what you raise so that we can announce it. Passionate about something else? Consider how you might incorporate that into our do something challenge. We are excited to announce four award packages! Are you interested in finding out what career opportunities are open to students who persist in the sciences? Do you want to hear about how successful NIH scientists got to where they are today? The NIH will work with the winners to provide a special career event. Depending on the location of the winners, they may either be hosted at the NIH or the NIH will send an expert to the winners' schools. Have you ever considered what it might be like to work at the National Institutes of Health but found the application process challenging? What if you could get some personal assistance with the process that could help your chances at securing a spot? 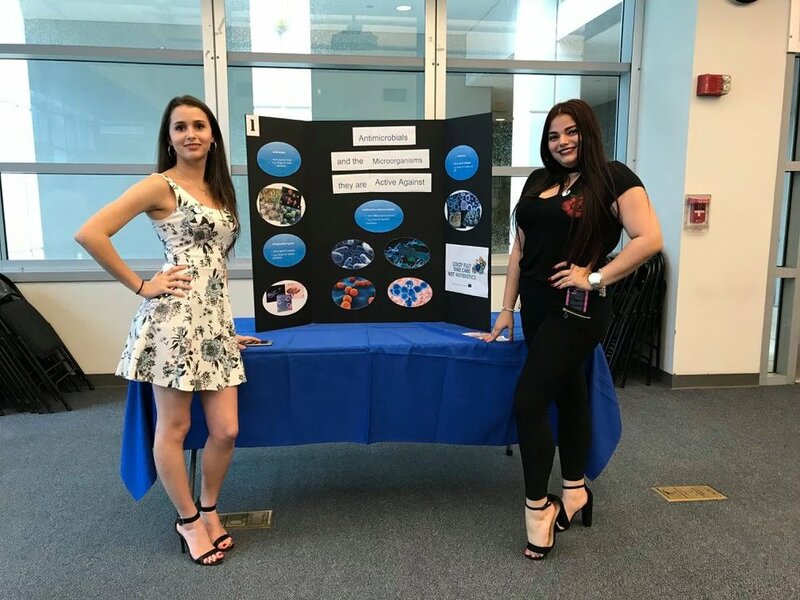 For winning students or up to two members of each winning team, the NIH will help facilitate the application process for summer internship programs at the NIH and open summer volunteer positions. Imagine hearing a rockstar scientist recognize your winning contribution. Depending on the location of the winners, the head of the National Institute of Allergy and Infectious Diseases (NIAID), Dr. Anthony Fauci, will either meet with the winners (if they are local) or create a video message congratulating them (if they are not local). Dr. Fauci was appointed Director of NIAID in 1984 and oversees an extensive research portfolio of basic and applied research to prevent, diagnose, and treat established infectious diseases such as HIV/AIDS, respiratory infections, diarrheal diseases, tuberculosis, and malaria as well as emerging diseases such as Ebola and Zika. Dr. Fauci has advised five US Presidents and the US Department of Health and Human Services on HIV/AIDS and many other domestic and global health issues. He was one of the principal architects of the President’s Emergency Plan for AIDS Relief (PEPFAR), a program that has saved millions of lives throughout the developing world, and has made seminal contributions to the understanding of how HIV destroys the body's defenses leading to its susceptibility to deadly infections. Further, he has been instrumental in developing treatments that enable people with HIV to live long and active lives. Dr. Fauci has also made many contributions to basic and clinical research on the pathogenesis and treatment of immune-mediated and infectious diseases. He is one of the most cited researchers of all time. Have you ever wanted to learn about what goes on inside a biocontainment laboratory? 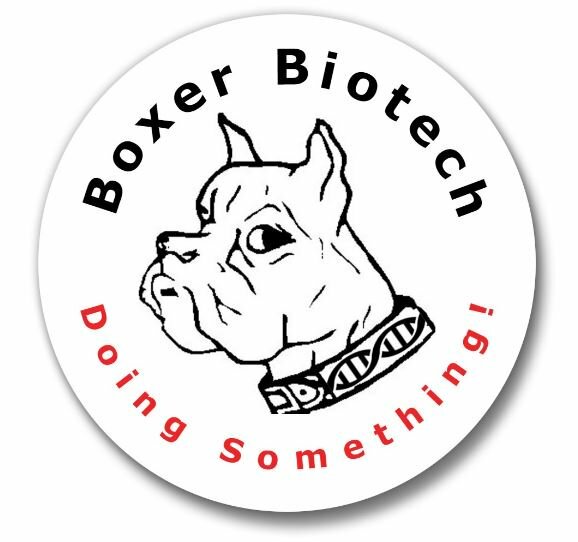 Depending on the location of the winners, the NIH will facilitate a special laboratory tour at the NIH's biocontainment laboratories (BSL-3/BSL-4) or at a nearby laboratory. Perfect for Snapchatting, Instagramming, and Tweeting your success to the world and proudly displaying on your wall. Your dream of possessing items with the NIH logo is within reach! …or at least acclaim from the Small World Initiative and NIH. Your award will be announced on our website and through social media, and you will be profiled online. Dr. Hicks is a Medical Epidemiologist in the CDC’s Division of Healthcare Quality Promotion, National Center for Emerging and Zoonotic Infectious Diseases; the Medical Director for the CDC’s Antibiotic Awareness Program; the Director for the CDC’s Office of Antibiotic Stewardship in the Division of Healthcare Quality Promotion; a Commander in the US Public Health Service; and an Adjunct Professor of Medicine at the Warren Alpert Medical School of Brown University. She leads research on antibiotic use and resistance trends and serves as the Get Smart spokeswoman. Globally, she has fostered CDC, European Union, and World Health Organization collaboration leading joint antibiotic awareness observances. Her expertise is in bacterial respiratory diseases, outbreak investigations, and antibiotic resistance and use. Imagine where you might fit in the history of public health as you tour the David J. Spencer Museum on a global health odyssey. Granted you might only be able to take advantage of this perk if you will be near Atlanta, Georgia. …or at least acclaim from the Small World Initiative and CDC Antibiotics Awareness Program. Your award will be announced on our website and through social media, and you will be profiled online. The winner will receive an invitation to the Sociedad Española de Microbiología's (SEM) National Meeting on July 19, 2018 in Madrid, Spain where they will have the chance to meet researchers and the SEM Young Researchers group. The Sociedad Española de Microbiología's Education Division (D+D) will award a Spanish SWI-D+DSEM award that will be given at their National Meeting. Perfect for Snapchatting, Instagramming, and Tweeting your success to the world and proudly displaying on your wall. …or at least acclaim from the Small World Initiative and SEM. Your award will be announced on our website and through social media, and you will be profiled online. Note: All other student entries will be posted on a special page on the Small World Initiative website. The winners will be selected based on the reach and depth of the impact of his/her actions. A Selection Committee will be made up of persons from the Small World Initiative, SWI faculty, and CDC and NIH staff. Any conflicted parties will not vote on the final winner. By submitting an entry, entrants agree that the Small World Initiative may use, repost, and publish entries. Entrants will be credited if/when their entries are used. 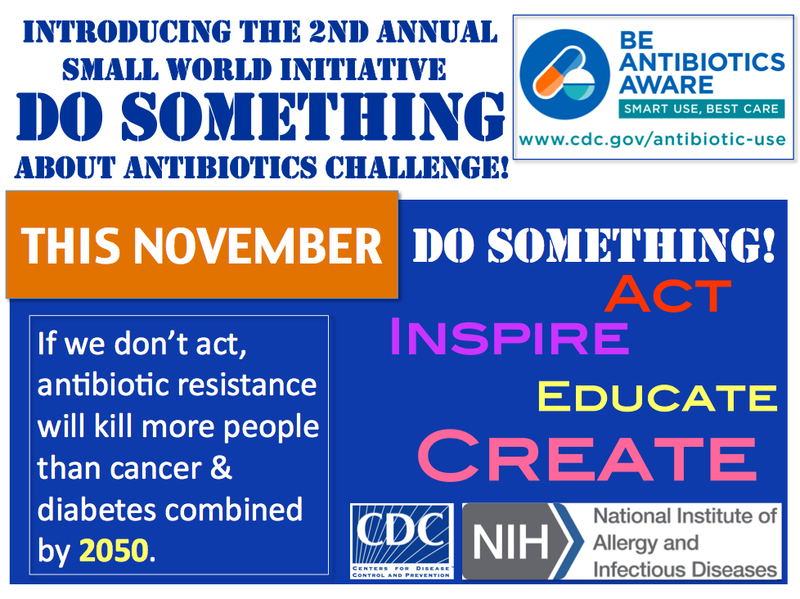 The Small World Initiative’s Do Something About Antibiotics Challenge™ is part of our Do Something Challenge™ series. For more information, please call us at 347-762-4818 or contact us.